Hotel guru. Armchair psychologist. Traveling philosopher. Author. Speaker. Teacher. Student. 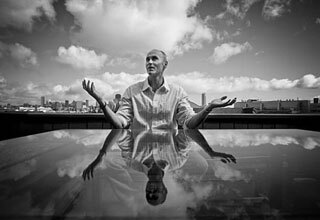 Chip Conley has lived out more than one calling in his lifetime. Chip shares his unique prescription for success in PEAK: How Great Companies Get Their Mojo from Maslow, based on noted psychologist Abraham Maslow’s iconic Hierarchy of Needs. His captivating TED talk has been viewed over 2m times. The New York Times bestseller, EMOTIONAL EQUATIONS: Simple Truths for Creating Happiness + Success, is Chip’s latest book where he takes us from emotional intelligence to emotional fluency – placing meaning at the top of the balance sheet. His previous books include The Rebel Rules: Daring to be Yourself in Business, and Marketing That Matters: 10 Practices to Profit Your Business and Change the World. Chip presents his theories on transformation and meaning – in business and life – to audiences around the world and he’s been a featured speaker at TED. Honored with the 2012 Pioneer Award – hospitality’s highest accolade – The San Francisco Business Times named Chip the Most Innovative CEO – and JDV the 2nd Best Place to Work in the entire Bay Area. Chip received his BA and MBA from Stanford University and holds an Honorary Doctorate in Psychology from Saybrook University, where he is the 2012/2013 Scholar- Practitioner in residence. He served on the Glide Memorial Board for nearly a decade and is now on the Boards of the Burning Man Project, the Esalen Institute, and Youth Speaks. In 2013, Chip launched Fest300 where he shares his passion for world festivals. And, he joined Airbnb as Head of Global Hospitality & Strategy, where he’s sharing his proven methods with hosts in nearly 200 countries.